(CelebrityAccess News Service) – After three years of rotating bass players, special guests, one night stands and cheap thrills, Gov’t Mule is ready to settle down with long-time friend and bassist Andy Hess. 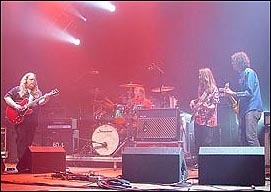 Gov't Mule, comprised of founding guitarist and drummer Warren Haynes and Matt Abts with keyboardist Danny Louis, has been without a permanent bass player since original bassist and founding member Allen Woody passed away August 2000. "We've been fortunate to have many amazing bass players tour and record with us," says Haynes. "When we played with Andy Hess, it felt like a band." ATO Records will release Gov’t Mule’s latest offering "The Deepest End" on Tuesday, October 7. The bundled DVD and two CD package will include 32 songs from the May 3, 2003, Saenger Theatre concert as well as behind-the-scenes footage and interviews with Gov't Mule and special guests. To celebrate the release and the announcement of Hess’s new permanent status, Gov’t Mule will perform on “Late Night with Conan O’Brien” on October 8. They’ll follow up with another stint on the road dubbed "Rebirth of the Mule Tour" with special guests Chris Robinson & New Earth Mud.